Drew's Panther | This started as the rebuild of my 1937 M100 Panther but has grown to include other things. 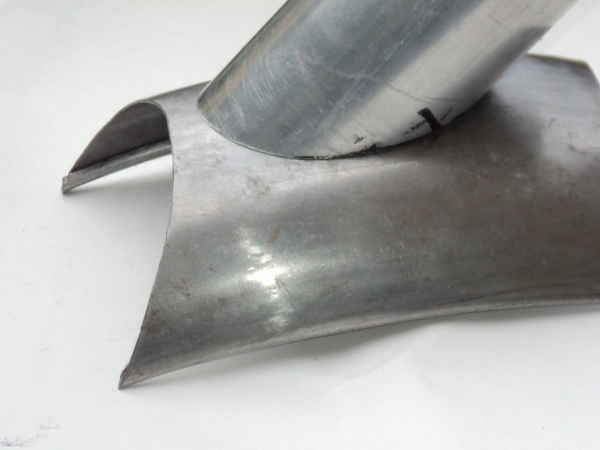 Following from the last post the top coating repair on the front mudguard has been completed. When I had a look at things the next day I was very happy as to the finish, the “Craftsman” paint I was trying out as a replacement for my old favourite “Tekaloid” came through with flying colours. Only trouble was the contrast with the old paint, this had weathered over time so the new paint stood out like the proverbial on a barn door!. So I broke out the “T-Cut” and gave the guard a good rub down and that did the trick, you no longer noticed the repair unless you looked closely, snag is I now have to do the rest of the bike to get it to match the front mudguard!. The pressed-steel framed BMW’s, such as the R12, are quite heavily pinstriped so this repair has left a gap in the lining on the front guard that I’ll need to patch, so I now need to break out the lining brushes. 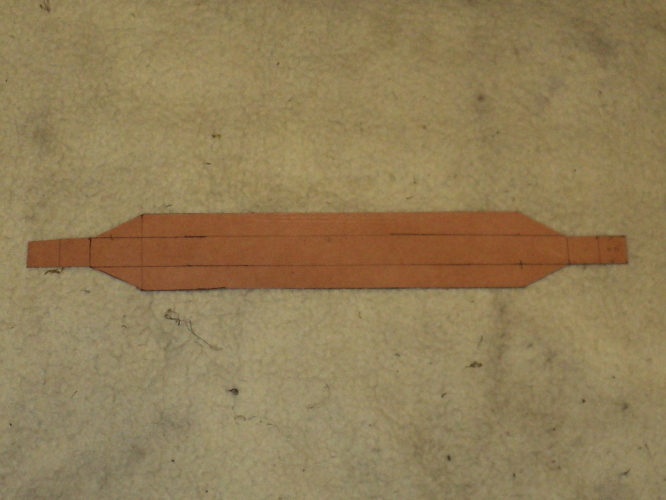 Lining is properly done free-hand and the difficult bit is getting a tight curve without smearing. My way round this is to mask out the line so that any smear goes onto the masking tape, problem is that with the BMW double line I’ll need to do one line and let it harden off before I can mask off to do the other. I’ve also had the old girl out on the road for a run to see how things were. I found that while she was willing to start and run, the start-up from cold was not as willing as it used to be and she was very reluctant to start from hot. What I’ve done today is to treat her to a pair of new plugs, the old ones had been in for a long time now. 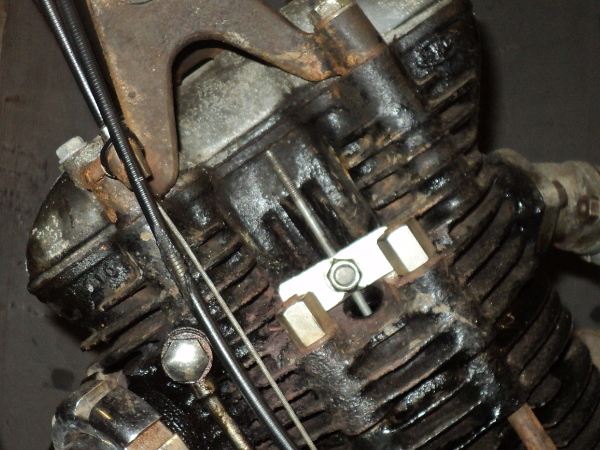 I’ve also had the carburetters off and stripped and cleaned them, they have been standing for a couple of years and what fuel had been left in them had dried out and left a “varnish” of crud inside the passages and jets. Fortunately she’s running on a pair Amal 276’s and these are an easy carb to strip down and clean. I’ll need to synchronise the slides opening before I take her out again and while that’s a fiddly job it’s not that difficult. 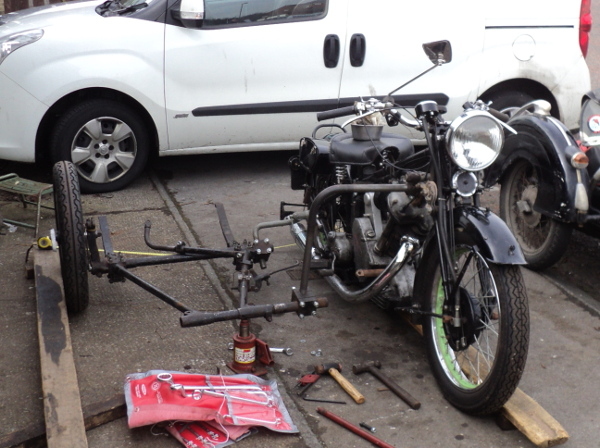 I’ve also offered up the sidecar chassis to the bike. Before I actually fit it I’m wanting to rig a sidecar brake. I had a sidecar brake on the Panther outfit and found it useful, after all the bikes brakes are from the 1930’s and brake technology has come a fair way since then so every little helps. The rear brake on the R12 is operated with a heel operated pedal on the right-hand side. 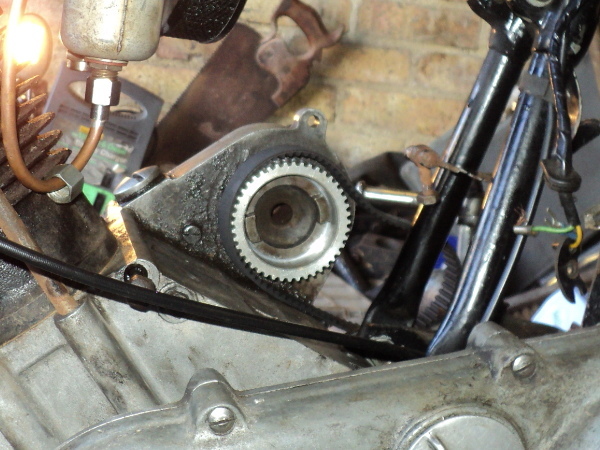 What I’m doing is to mount another pedal onto the sidecar chassis with a lever coming straight across to the bike and level with the bike’s rear brake pedal, so that its pad lies alongside the bike’s one. This means that when I apply the bike’s brake I’ll also apply the sidecar brake as well, and by rocking my foot I can vary their relative pressures. However I’ll also be able to apply either brake on its own to give differential braking which can be useful to assist in cornering. Only thing now is that while I’ve the brake pedal set up I’ve still to arrange the cable fitment at the drum end of the system, as a “By The Way” the chassis I’m using is from an LS200 Steib. The wheel is from a Ural/Dneiper, a half width hub that looks in keeping with the R12 and the brake itself is an Enfield type from a rigid-framed Panther. 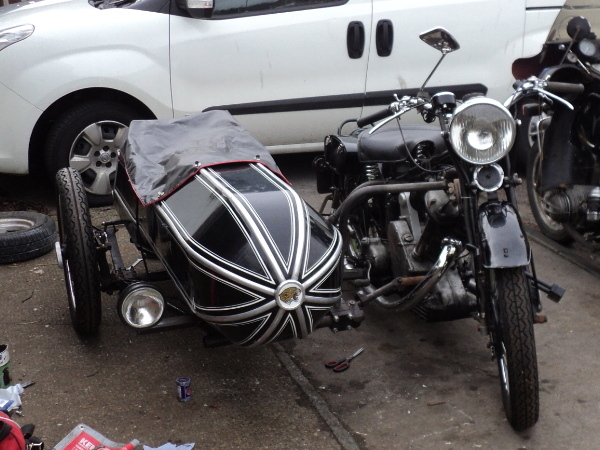 This entry was posted in BMW, Sidecar on April 6, 2019 by Drew. It’s been a while since I posted anything on this blog, too long! But there’s not been much happening with the bikes as they’ve been running well. However I’m feeling in need of a change now so–. 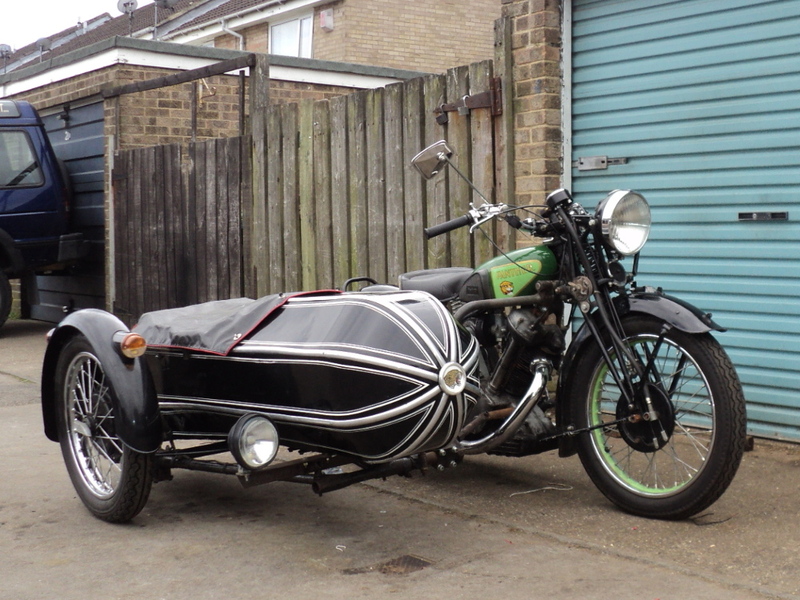 I took the sidecar off the big Panther a couple of days ago, not the easiest of jobs when working on your own, but do-able, the body is now up on a pair of trestles in the shed and the chassis is in the back yard. The Panther now stands as a solo in the garage, but she’s not on her own as the old BMW has been brought out of storage and is standing beside her. They make a good pairing, the 600cc 1937 Panther M100 and the 750cc 1940 BMW R12. 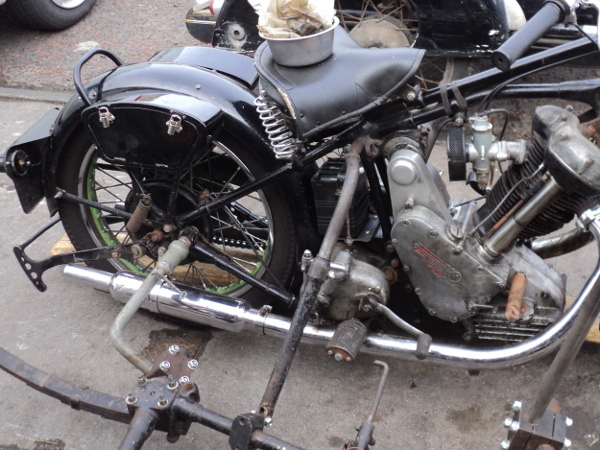 Although the Panther has the smaller displacement engine of the two she is the more powerful at 26bhp to the BMW’s 20bhp, but the BMW is a twin cylinder side-valve with a heavy external flywheel so is possibly the better slogger of the two, still neither was intended as a sports bike. Anyway the BMW is set up with a full set of Steib quick release sidecar fittings so once I have the chair set up for her I can drop it on and off in around five minutes work, Useful!! Now, what does the BMW need doing to get her in commission again? Well her battery is an AGM sealed unit and has survived her laying up, still showing about half-charged when I put it on the charger. She is magneto ignition and that’s sparking well but I’ll treat her to a new pair of plugs. How about oils?, well oil is cheaper than metal so it’s new oil all round, and owing to her age it’s an old-fashioned non-detergent type oil. Equally I needed new drain and filler plug gaskets. On a machine of this age these should be the hollow rolled-copper type rather than the solid aluminium ones BMW now supply. 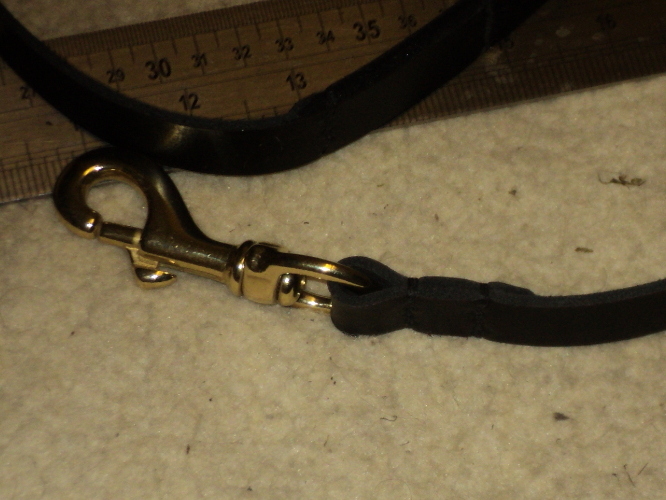 A quick rake round on ebay soon found a supplier of these in the neccessary 14mm and 18mm sizes. Rather than run her up to hot on the old oil I let her drain out overnight and then it was just a case of fill the engine to between marks on the dip-stick and the gearbox and final drive until the oil reached the bottom of the filler hole threads. Now came the acid test, she’d been stored with a dry tank so I put a half-gallon of fuel into the tank, no leaks visible! GOOD! !, turn on the tap (which way is “ON” and which is “RESERVE”? ?, I can’t remember!! ). 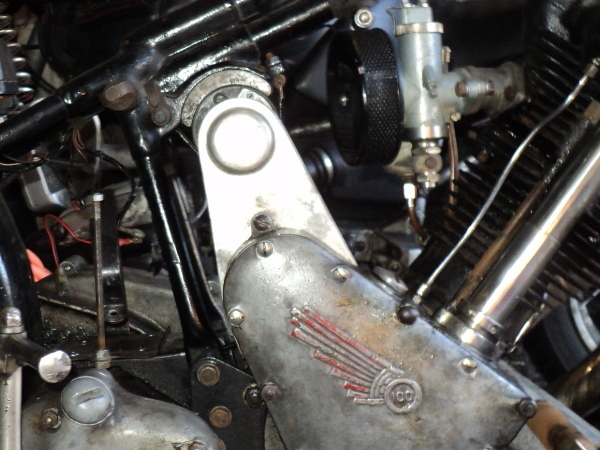 OK, the carbs had filled so a good tickle on each carb, crack open the throttle and turn over the engine several times to prime the cylinders, then it was just switch on the ignition and kick her over. While she fired she didn’t pick up so a tad more throttle, try again and the old girl was running again! Tick-over balance is a bit off but I’ll need her warmed through to set that up so it will have to wait. Now I know she’s a runner what else needs doing. An immediate obvious is indicators!. Last time out she was hauling the chair. I know it’s non-original but on modern roads an outfit NEEDS indicators and now you can use LED units without overloading the electrical system so she was fitted up with lights on one side, the others being on the chair. So it was get another pair of indicators and fit them. I had to make up (and paint) a set of mounting brackets for them, run in the wiring and then tap it into the circuit to the sidecar indicators, a quick check and found they were working. Next thing was cosmetics, the front mudguard needed some serious touch-up where the paint had been badly scarred and had started lifting while the old lady had been sitting in the storage unit. Fortunately it can be redone while still on the bike as it would be serious hassle to remove it and then given a dose of “T-Cut” after about a fortnight’s curing followed by a polish job should see things OK.
As I’m writing this she’s standing in the garage with the first top coat on the guard giving it time to harden off before she’s put away for the night, another coat tomorrow should then see it ok. I can’t really complain as both guards were in a bad state when I got the bike back at the beginning of the Eighties and they needed serious patching to be made usable, since then she has seen some serious mileage! This entry was posted in BMW, Panther on March 23, 2019 by Drew. 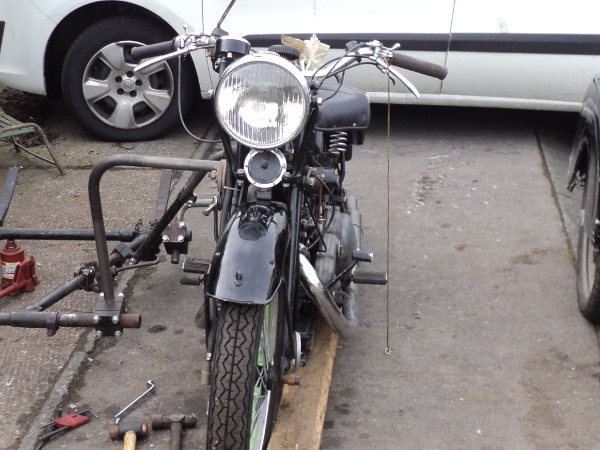 With the sidecar fitted and aligned, before I can take it out on the road it needs lights to be legal. With it being a 1937 machine I just need to show “a white light to the front and a red light to the rear”, after all at that time gas lighting was still common, but as this outfit is to be used on modern roads I need to be a bit more practical. What I am fitting is a spotlight set up as a Daylight Riding Light, a white front running light, a red rear running light, a stop light and indicators. Indicators are totally out of period but in modern traffic on a sidecar outfit they are “A DAMN Good Idea!”. I had a pair of the Hella round indicator/running lights in stock so these became the basis of my lights. As the wheel and mudguard (fender) are on the outside edge of the outfit the lights need to mount onto this but as the guard is semi-circular this gives a problem, the Hella units are intended to fit onto a flat, vertical surface and the guard has a compound curve, at the point where the lights need to mount there is a 45° slope to the vertical. First thing was to make the mounts for the lights. These need to fit onto the guard and give a suitable surface to mount the lights. 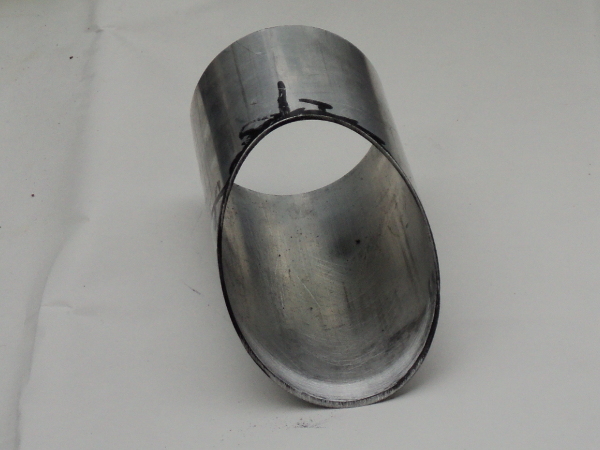 As the lights are 75mm in diameter I took a 6 inch length of 75mm OD alloy tube with a 1.5mm wall thickness and cut it into two lengths on a 45°angle. These, when mounted onto the guard will fit onto the guard part way up it and give the necessary vertical surface, unfortunately though the plain cut end does not match the curves of the guard. so I took this, fixed some 80 grit abrasive sheet to it. and then started rubbing the mount on the abrasive sheet. This gave me “witness marks” showing where the guard was contacting the mount and so, where the mount needed trimming back. This was done using a Dremel tool and a sanding drum. Repeated re-blacking, trials and trimming gave me a pair of mounts that were a reasonable fit onto the guard and which, given some rubber beading, would make a sound joint against it. I now needed bases for the lights themselves. To make these I took a pair of 10mm thick alloy disks of about 85mm OD. and had a central 8mm hole drilled through. After this they were removed from the chuck their place was taken by a short length of 32mm OD bar. This had its end faced flat and then had a central hole drilled into it. This was tapped to take an 8mm bolt. This gave me a mandrel to work the disk on and so one of the disks was bolted to it, this meant that I could now turn the disk about it’s centre and it was able to have the edge turned down to size. This disk was now skimmed down to 75mm diameter, the same as the OD of the tube. 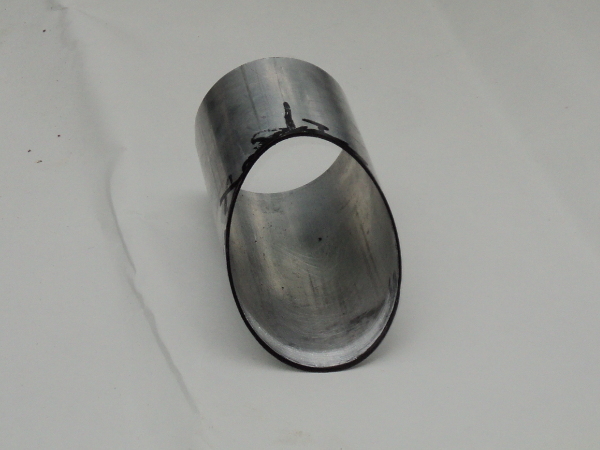 Next step was to turn a 4mm deep spigot on the disk to make a tight fit in the tube. I then reversed the disk on the mandrel and another 4mm deep spigot turned on the other side, this time sized to mount the Hella lens onto. Suitable mounting holes were drilled and tapped into the alloy to take the lens mounting screws. All that was now needed was to supply light to the lenses and rather than use incandescent bulbs I opted to use LED lights instead. Going onto Ebay, I ordered up 4 amber, two red and two white LED marker lights. These mount with a 10mm stud on their backs. As these are the equivalent of a 10 watt bulb the intention was to use two amber LEDs to supply each indicator,one white for the front running light and two reds for the stop light. Going to the disks, I marked off the horizontal diameter through the lens mounting screws and drilled a pair of 10mm clearance holes above it. One one disk I then drilled a single 10mm clearance hole below the centre line and on the other a pair below the line. Mounting two of the amber LED’s above the line gave me my indicators and the fitting the whites or reds below gave me my front running light and my stop light. 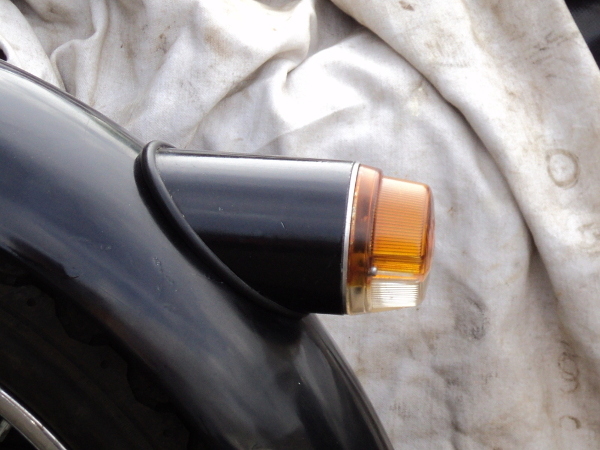 I needed a rear running light as well and so a similar but smaller unit was made up using a 50mm diameter LED rear marker light to supply the lens. All that was left to do was give the mounts a lick of paint, mount them onto the guard via the central hole in the disks and to run in the wiring. This entry was posted in Panther, Sidecar on May 18, 2016 by Drew. As the old lady was being laid up for the winter the chance was taken to drain and remove the fuel tank,‭ ‬this was rinsed out to remove any accumulated crap from across the season and the tank stored on a shelf out of the way.‭ ‬With the modern petrol brews having a limited shelf life it’s no longer a good idea to leave the tank full over the winter. 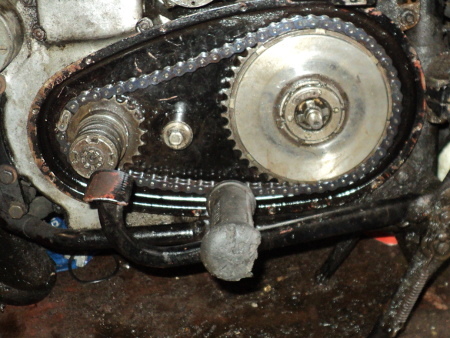 This had cleared the decks so next step was to remove the timing cover. 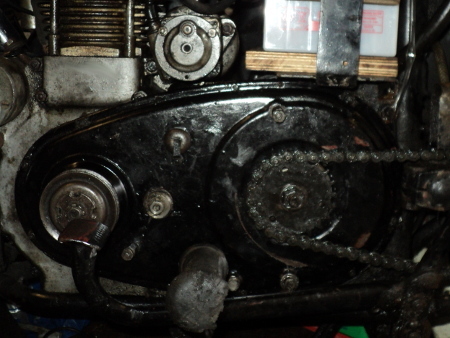 The joint was initially just cracked open so as to drain the oil and then the cover was removed,‭ ‬forgetting of course to catch the oil pumps pressure pad and spring as they dropped into the drained oil‭!‬. Having fished them out of the drain pan they were wiped clean and put to one side and I found that unlike on the later motors,‭ ‬the magneto timing gear on my bike is not drilled and tapped to take a puller,‭ ‬it needs a claw type puller‭ ‬and, with the one I have, the legs foul against the timing case wall and prevent it getting a straight pull on the gear. 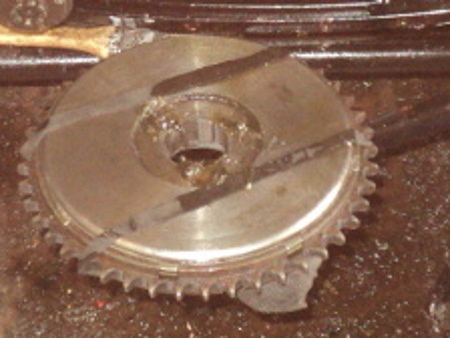 However on the older Panthers, such as this one, rather than the outer drive disc and the shaft being in one piece the shaft has a separate drive disc on one end and the timing gear on the other. This meant that I could pull the drive disc from outside the timing case where there is easy access for the puller so it was just a case of unscrew the retaining nut and pull the disc. 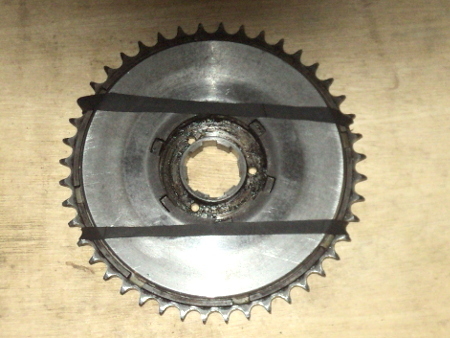 Old Type Chainwheel, notice amount of wear! Intention was to fit the puller and apply sufficient tension on it to hold things in place before the disc was heated with a gas torch. Idea was to get the disc to expand a bit and then apply pressure before the heat was conducted to the shaft and expanded that as well, so it has to be done quickly. Problem appeared in that the moment the puller screw was put in place and before any real pressure was put onto it, the threaded end of the shaft split in two! BUGGER!! 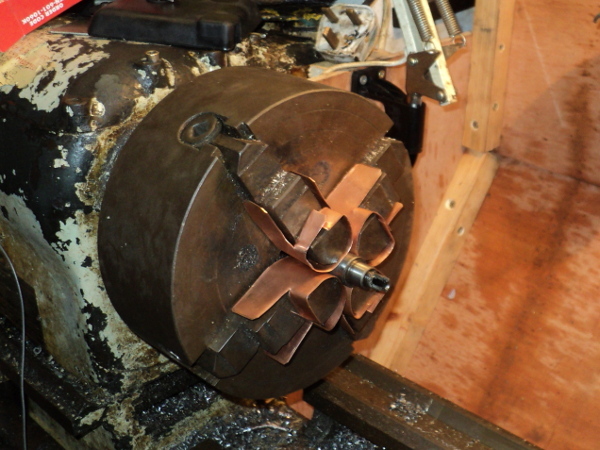 Turns out that this is a not unknown problem on these motors, the shaft end being over hardened in manufacture. 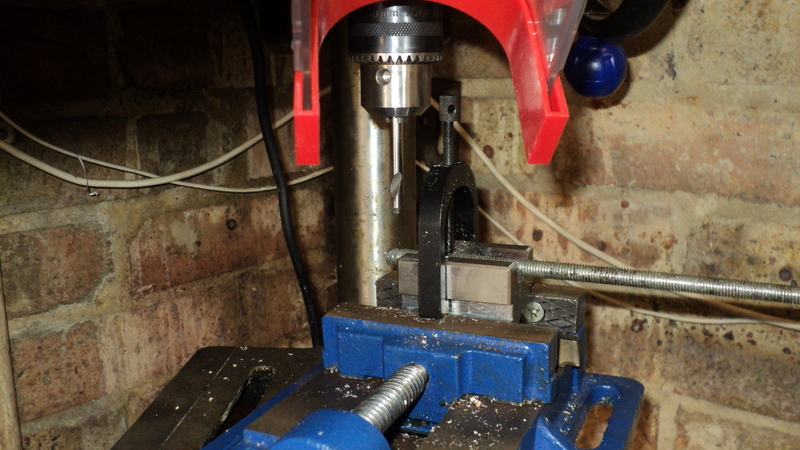 So I set to and turned up a pressure bushing on the lathe to press against the shaft end rather than the thread end. 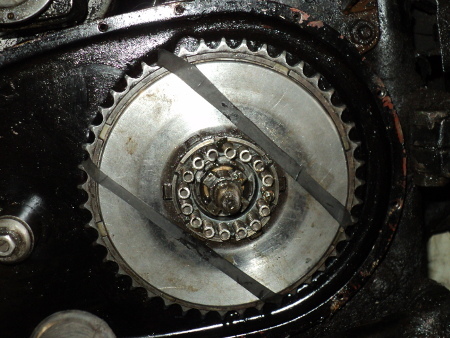 Anyway, that worked, the disc was successfully removed and the shaft and gear could be removed from the timing case. Next step was to replace the shaft with the converted one from the spare motor, only to find that it did not fit!. It seems that P&M increased the shaft diameter across the war years, TYPICAL!. 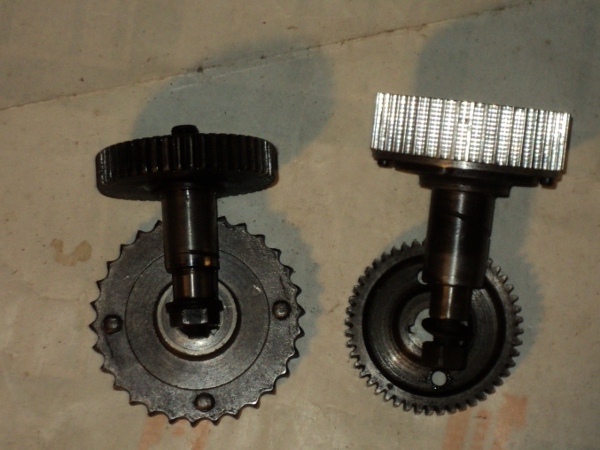 Not only that but they altered the pressure angle of the gears so they are not interchangeable either. This meant that I had to repair the damaged shaft, not so easy since it was through-hardened. So the 4-jaw chuck was put onto the lathe and copper shoes put onto the jaws so as not to mark the shaft’s bearing surface. Using the 4-jaw meant that I could set the shaft to run dead true which was accordingly done and the broken end trued off. 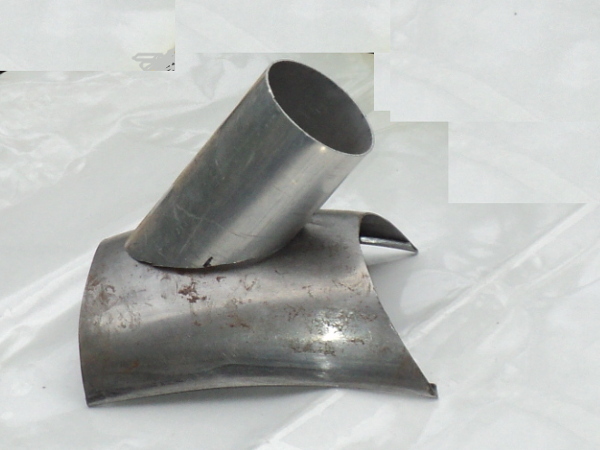 The shaft itself was already centre drilled so it was just a case of opening the bore up to the appropriate tapping size. Since the shaft was a hard steel I used a cobalt stub drill for this job, a cobalt drill will tackle far harder steels than an ordinary jobber drill will, but their about three times the price!! Then it was just a case of carefully tapping out the hole to take a bolt and the job was done. 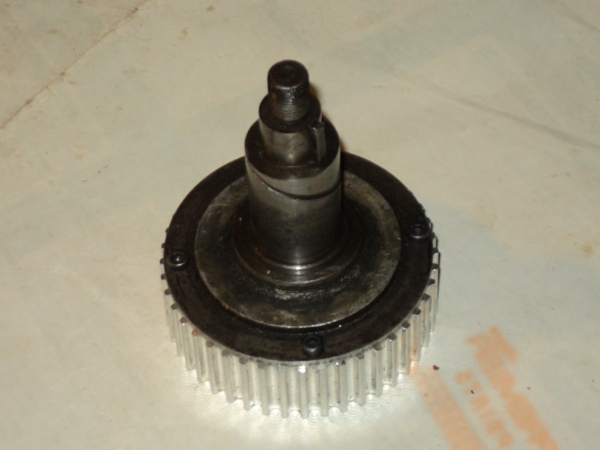 I then had to transfer the alloy pulley over from the other shaft flange and I could then refit the shaft. 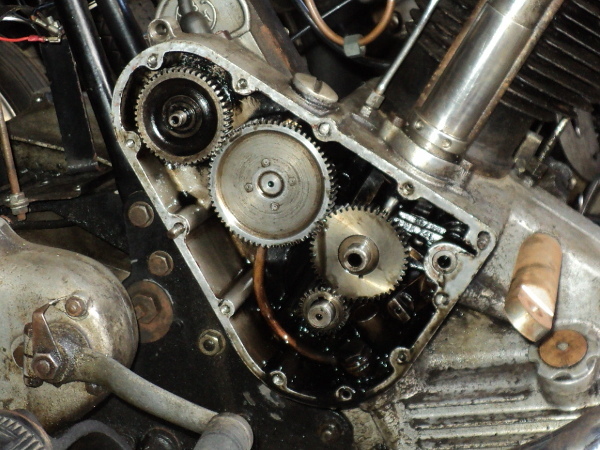 The shaft was then put in place in the timing case and the timing drive re-assembled. 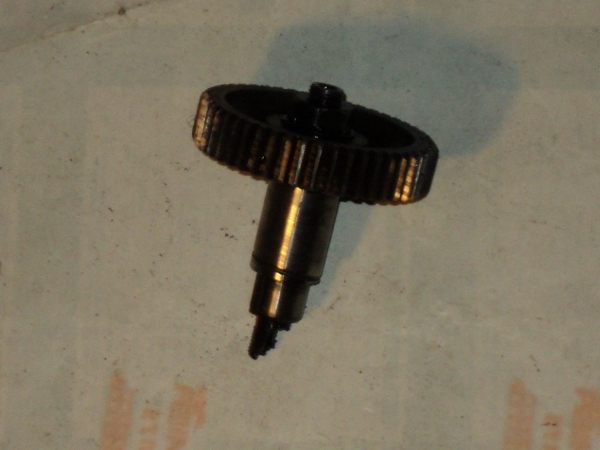 The oil pump gear has a pressure pad and spring to hold it in place, this was stuck onto the centre of the gear with a blob of grease before fitting the outer cover. On going to refit the magneto I ran into another two problems. 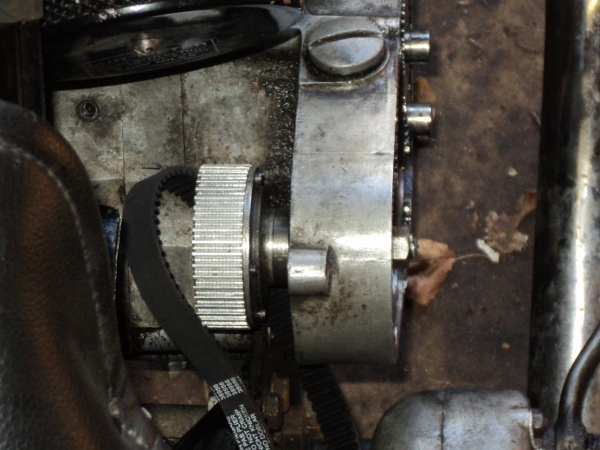 The first was that the new pulley masked the drive dogs on the bike side coupling. To get round this the magneto had to be put onto its platform at the rear of the cylinder so that its coupling could be slid into mesh with the other one, BUT the studs that secure the magneto in place fouled the base plate of the magneto and prevented it from sitting down onto the platform. Simple, you just remove the studs, put the magneto in place and refit the studs through the base plate! If only it were that easy! P&M in their ineffable wisdom had chosen to use studs with an enlarged collar in the middle. 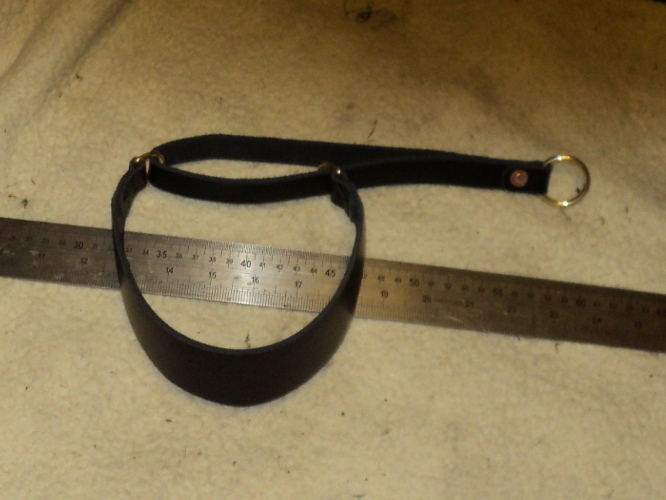 This collar sits down into a counter-bore in the platform so it does not normally interfere with the magneto’s base, but this collar will not go through the mount slots on that base, equally the studs are threaded 1/4 Whitworth on one end and 1/4 Cycle on the other. 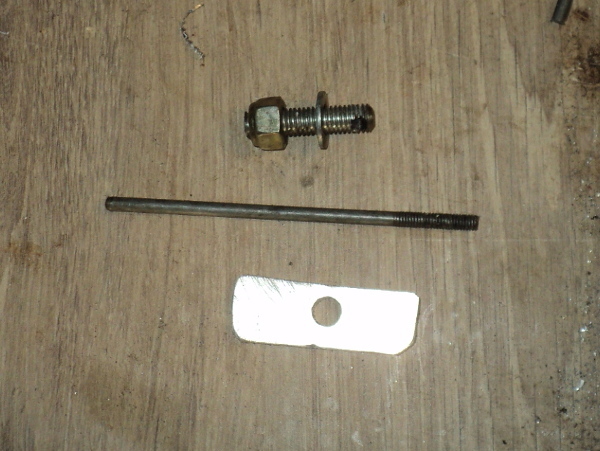 Short time remedy is to replace them with 1/4 Whitworth set bolts until I can source some double-enders but its not ideal as a Whitworth thread is more prone to backing off than the finer Cycle is. While I had the magneto off I took the chance to replace the drive dog with the clubs easy adjust version and herein lay the other problem!. The drive dogs on my bike, and apparently those on the later models using the “spider” type coupling, are 5/8 inch wide but the dogs on the clubs unit are only 1/2 inch wide, since my bike is among the first to use the enclosed valve motor, it looks like earlier models used a smaller size drive dogs. Now it was just a case of fitting the magneto and re-timing the ignition. Before fitting the magneto the endless drive belt for the dynamo had to be put in place, you can’t fit it afterwards, as I discovered!. Then it was just a case of fitting the dynamo itself, tensioning the belt and refitting the drive cover. 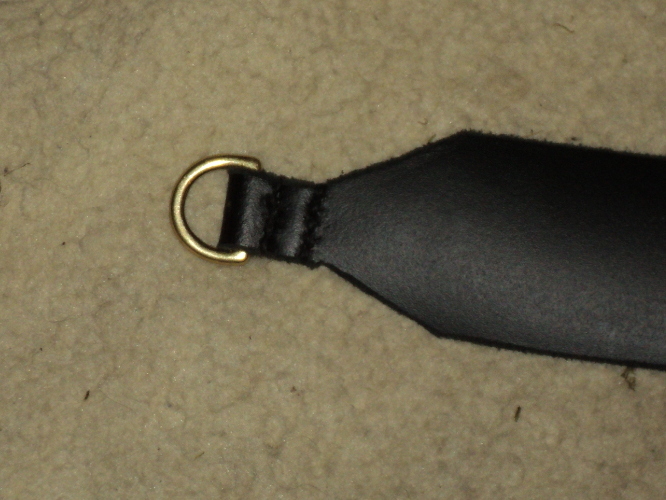 Once the cover is back in position the upgrade is invisible. This entry was posted in Panther on December 11, 2015 by Drew. Back in the early days of biking (and of cars!) what you bought was the basic machine. 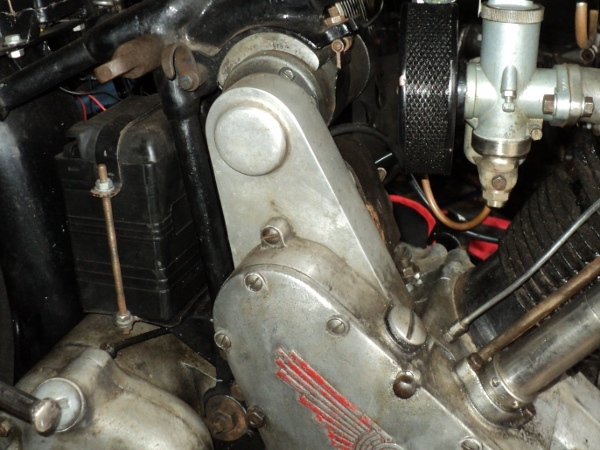 “Luxury” items such as lights were added after-market by the owner to suit their personal preferences and this meant that they came without any electrics other than a magneto for the ignition. For lights there was the choice between acetylene gas powered lights and electric ones, gas lights having the advantage of being a complete and separate system whose generator only needed to be kept filled with carbide and water but needed regular cleaning and refilling while an electric systems generator needed to be driven, a gas system was also cheaper than an electric. A cycle type dynamo driven by one of the wheels was tried but found wanting so it went to being driven from the engine, but it also needed a “power storage unit” that is:- a battery. Since it was an “add-on” this meant that the generator somehow had to be bolted on somewhere near the engine and then had to be driven from it somehow, even today on a car the alternator still is a “tagged on” part like this even after over 100 years of development!, but modern bikes have moved on from this primitive system. 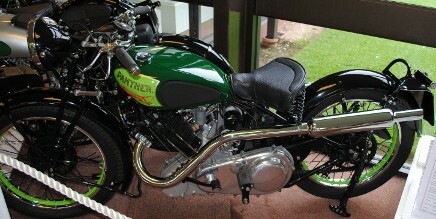 However my Panther is a 1937 machine. 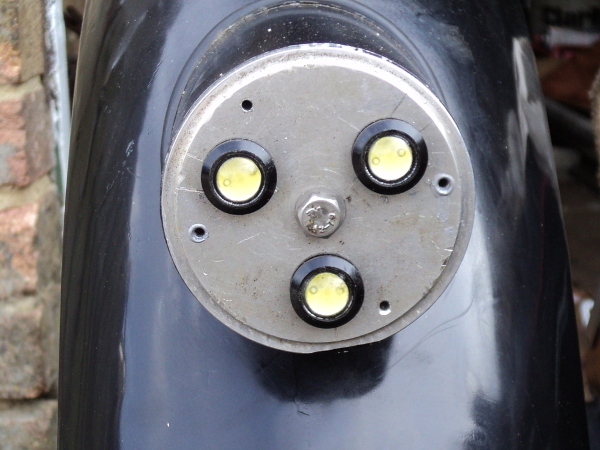 At this time, while bikes no longer came without lights as a standard fitting this was a recent innovation, as a “for instance” my 1929 Triumph was supplied without lights, they were still basicly a “bolt on” accessory. The Panther has a 6 volt 36 watt dynamo bolted to the frame top tube, just in front of the seat tubes, and this is driven from the magneto’s drive coupling by a small duplex chain, this chain having a cast aluminium cover. 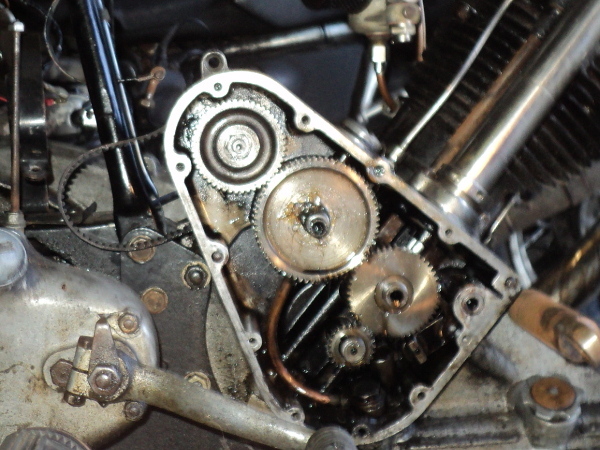 This drive is a known weak point on the bike, being prone to wear and possible breakage, and in the event of breakage it can cause damage to the engine housings and stripping of the timing gears in the event that the broken chain jams the magneto drive. 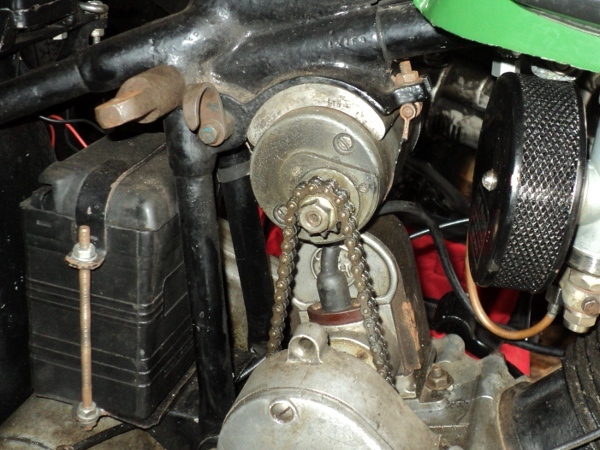 While it was not available back in 1937, there is a safer modern alternative available in the form of a toothed belt drive and I’ve decided to go this route since the dynamo chain on the old girl is showing signs of wear, as are the drive sprockets. Investigations on the internet soon showed details of what was available in the form of toothed belt pulleys and drive belts as well as sources of supply of these. 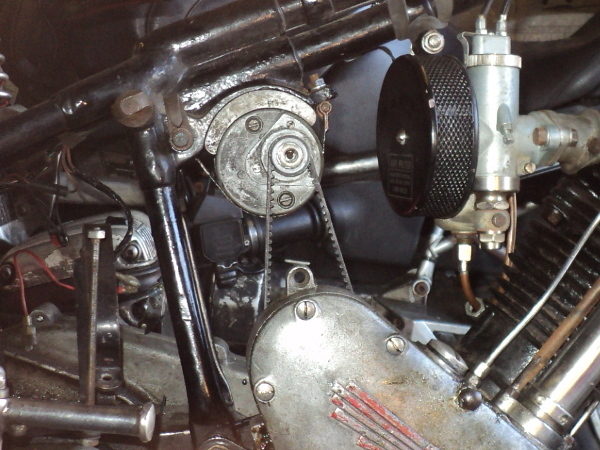 On the Panther the drive sprocket has 30 teeth on it while that on the dynamo has 11, giving a 2.7 to 1 “gear up” in the drive, a maximum RPM for the dynamo in the order of around 7,000 RPM and of some 2,500 RPM at 30mph. I have fitted an electronic 12 volt converter onto my bike and since a downside of this is that it has a higher dynamo “cut in” speed than at the original 6 volts I’m going to take advantage of the conversion to uprate the dynamo speed a little and have decided on the use of a 14 tooth pulley on the dynamo and a 44 tooth as a driver. This will give a dynamo speed of nearly 3000 RPM at 30mph and a maximum of around 8,000 RPM. From the use of these dynamos on other marques of bike I know this is well within the capabilities of the dynamo. 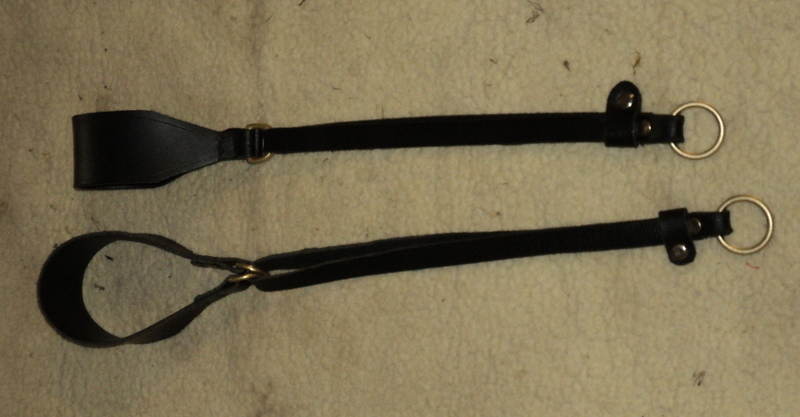 So I ordered up a pair of pulleys and a suitable toothed belt, which arrived two days later. 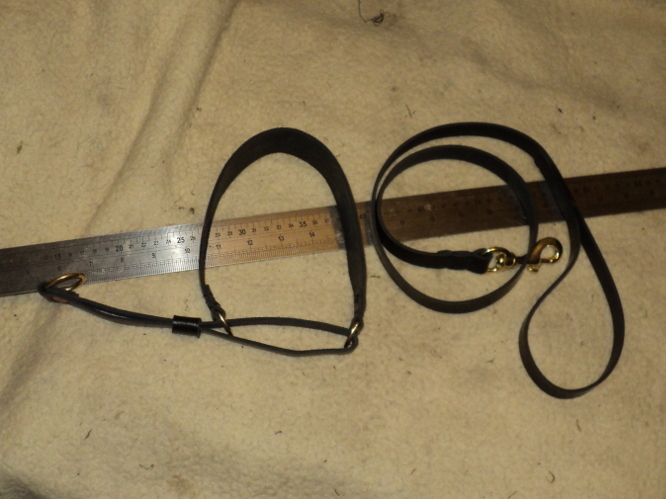 The small pulley turned out to be the neat belt width, there being a pair of cheek flanges to retain the belt in place and it was made from steel while the larger pulley was a wider, aluminium, unit and without the flanges so this will allow for a small measure of misalignment between the pulleys. 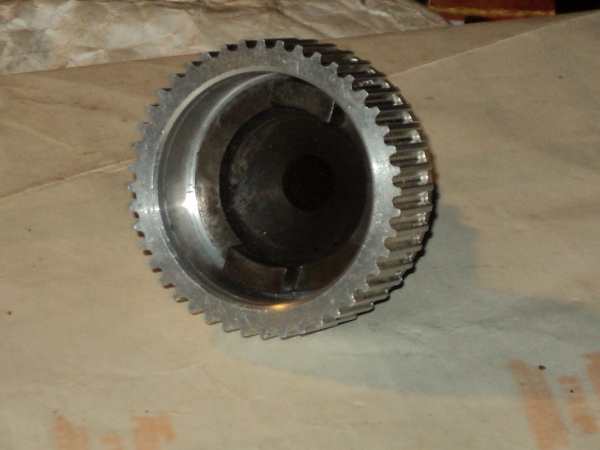 Both pulleys were supplied with a “pilot bore” in their centres. First thing was to sort out the drive pulley so as I have a spare drive coupling I decided to use that for the conversion. 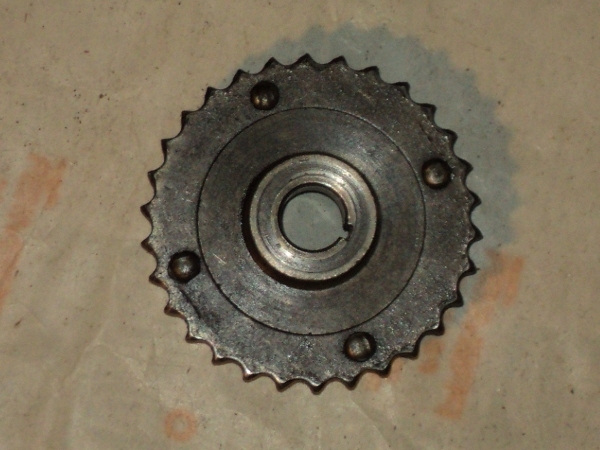 This had two chain sprockets, one riveted either side of a flange to give a duplex sprocket. 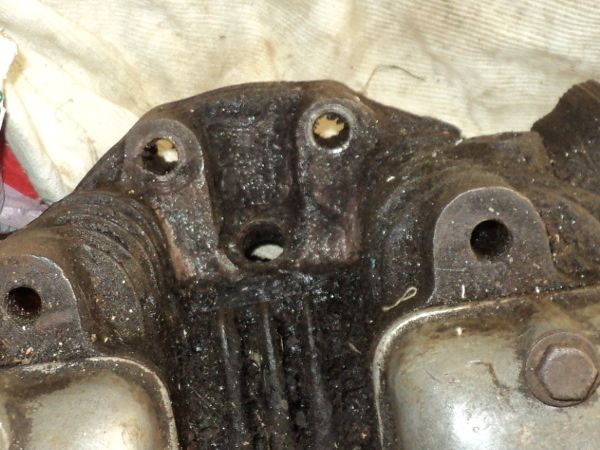 These rivets heads were accordingly ground off using a Dremel tool, the rivets driven out and the sprockets removed. 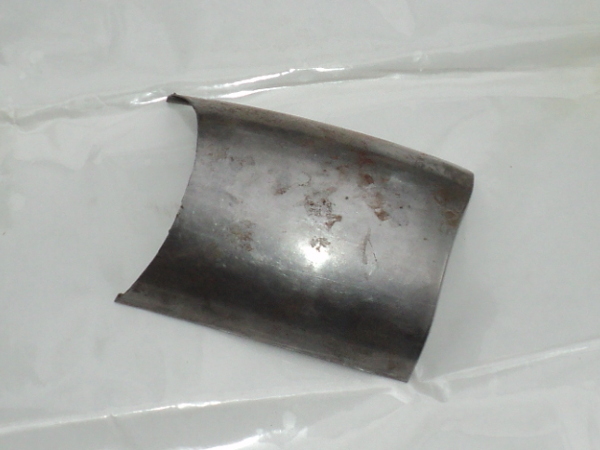 Once the coupling was offered up to the larger of the pulleys it was found that this flange was slightly smaller in diameter than the pulley and the rivet holes matched nicely with the side of the pulley and so could be used to mount the two together. 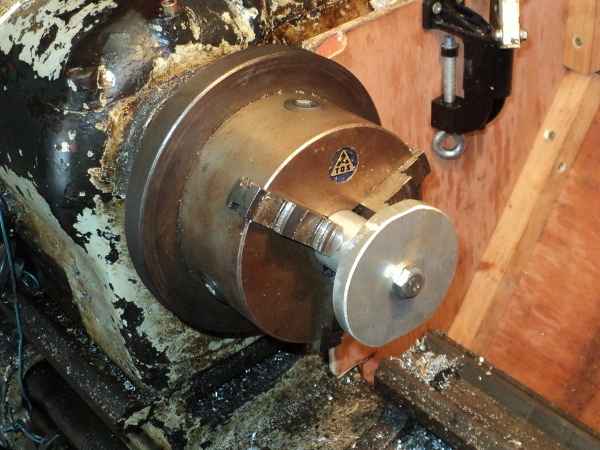 The pulley centre was then bored out on the lathe to match the register on the flange that had formerly located the outer sprocket. 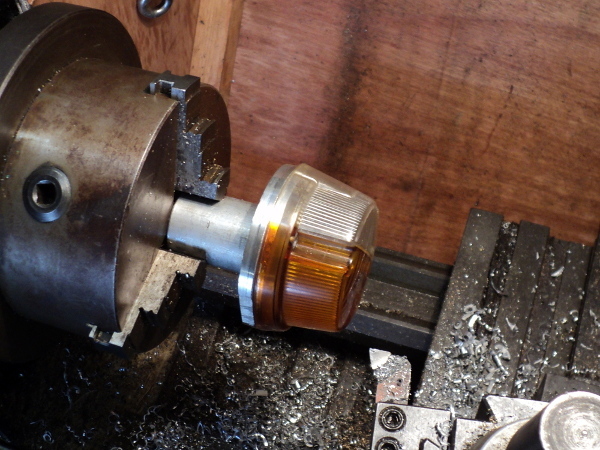 It was then counter-bored to give a good running clearance for the magneto coupling. 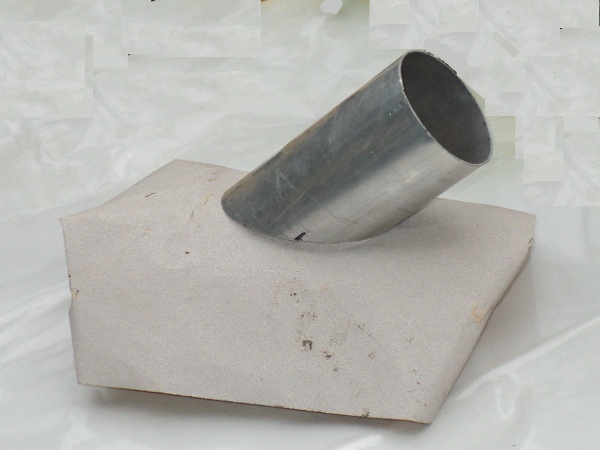 This coupling is a variation on an Oldhams coupling which has the advantage that it can cope with the two sides being a little out of alignment in both plane and angle but it does needs some room to “work” to do this. Once the pulley had been bored out it was fitted onto the location flange and the position of the rivet holes marked out on it. 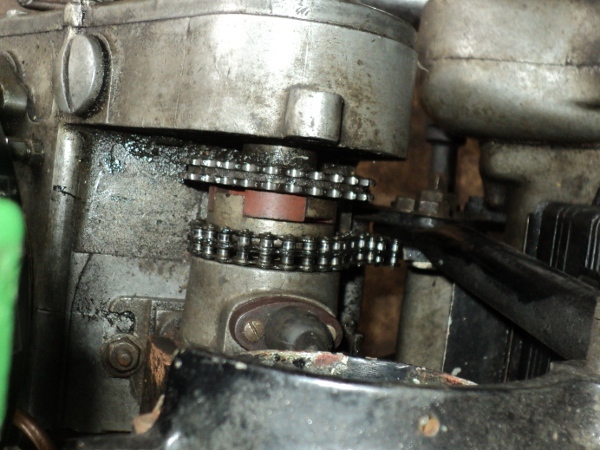 The original rivets were 1/8 inch diameter so it was decided to use 3mm Allen cap head screws in their place so the pulley was now drilled and tapped to suit and then secured in place, the screws being secured in place with Loctite. That left the dynamo pulley. The dynamo has a tapered shaft for this to mount onto. 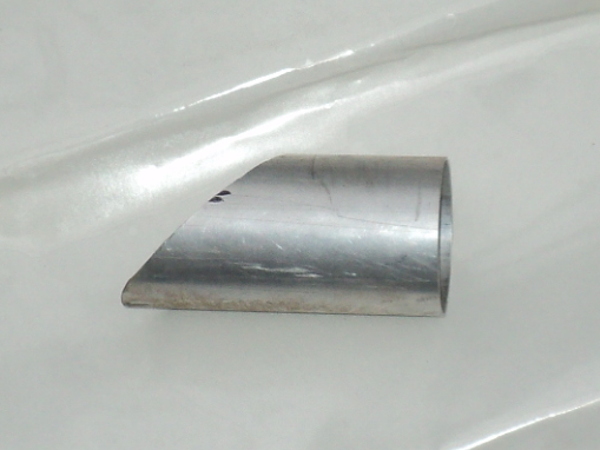 This taper is a standard size across all makes of dynamo, it also is the same as that used on magnetos and is a taper of 1:10 on the diameter. 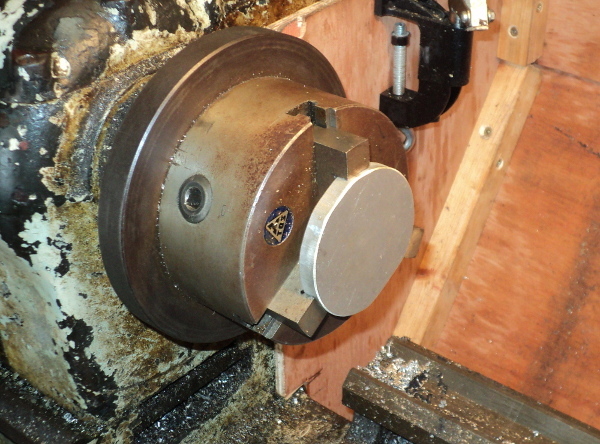 To machine this the top slide on the lathe needs to be set to the correct angle. 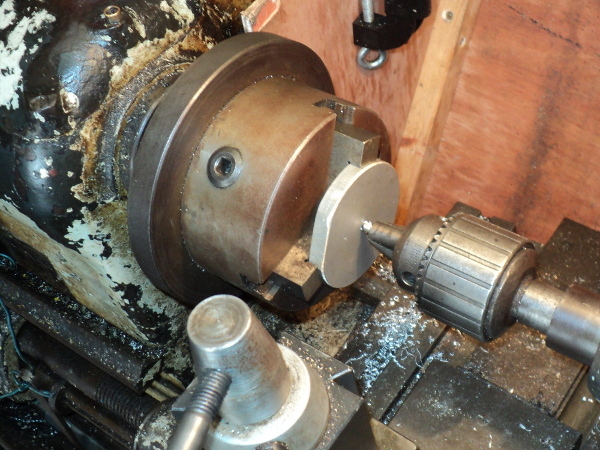 To do this I set up a test bar, known to be true, in the lathe and the top slide was adjusted to run true to this. 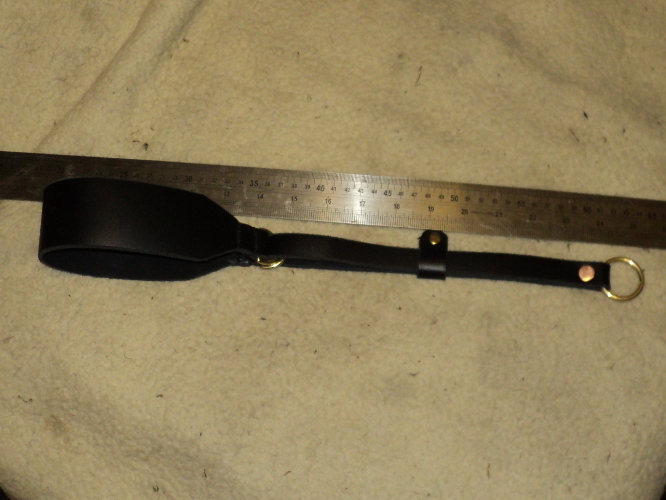 A 5 inch long ground tool-bit was then put in the tool-holder on the top slide and this was adjusted parallel to the test bar. 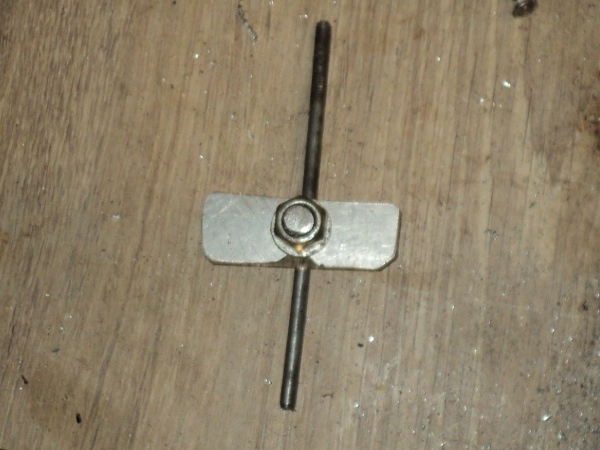 The top slide was then reset so one end of the tool-bit was against the bar while a ¼ inch drill was just nipped between its other end and the test bar. 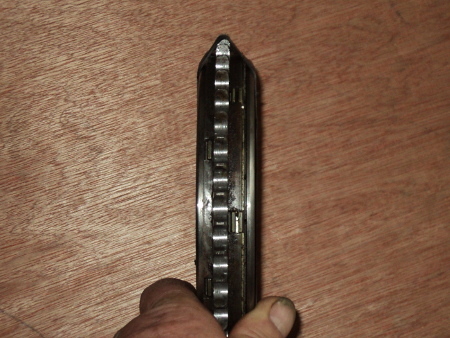 This meant that the top slide was now set to cut a 1:20 taper on the radius, 1:10 on the diameter. 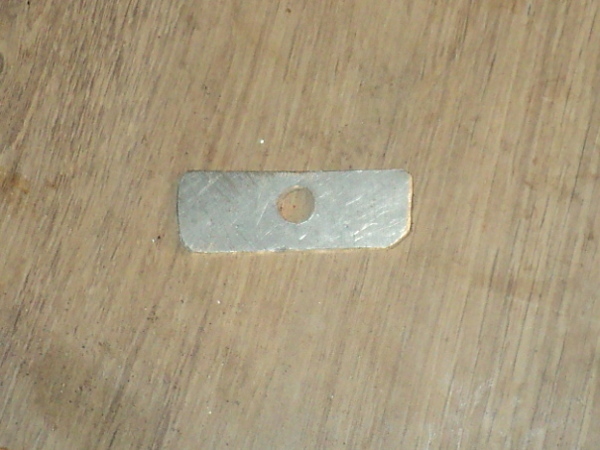 I then chucked up a length of half inch bar, cut a trial taper on it and tried an old chain sprocket on it. Needless to say it was not quite right but given another couple of tries, making small adjustments to the slide setting each time, and I had a satisfactory result. All that was left to do was machine the new pulley to suit and all was ready to fit to the bike. This entry was posted in Panther on November 15, 2015 by Drew.